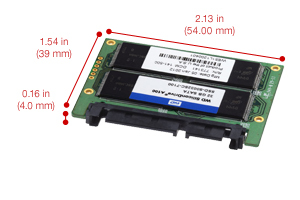 MO-297 (Slim SATA) defines the dimensions, layout and connector position for 54mm x 39mm solid state drives with a standard SATA connector. Adopting a standard form factor for these types of solid state drives will enable interoperability throughout the supply chain, benefiting drive manufacturers, product designers and consumers. Conforming to a single standard will simplify the product design process, shortening time to market and facilitating a reduction in costs.